First the disclaimer this video wasn't recorded by me as I took probably five minutes to beat the campaign versus this guy's 4. There are MAJOR SPOILERS so people who don't want them shouldn't watch the video or read this review (because we all know the Call of Duty story is the main reason people play the game). The core of Duty Calls is it bills itself as a parody when it really is satire since the game intends to wound and make a point about "realistic" shooters. 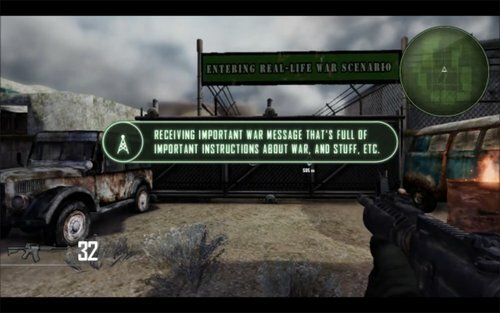 Story: Notice the very similar dialogue and loading screen with the perplexing musing of if "war has changed". I got a much more Metal Gear Solid 4 vibe from the loading part instead of Call of Duty. Next the soldier gets an important briefing from the general who isn't afraid to skip the unnecessary dialogue and only mention the import mission regarding a nuclear bomb. It's the generic story from Modern Warfare 2 and Black Ops redone to make more sense and the game narrative is better from it. Gameplay: The sign doesn't lie when it says "Entering real-life war scenario", an enemy soldier popped out and announced his intentions. This is a "realistic shooter" as my gun could be saying "boring" and the gameplay is unchanged. A great touch was the addition of the leveling system and from defeating one enemy, I ranked up to "Master Sergeant Shooter Person!". Talk about an increase in pay! I had no idea when I walked around the corner I would be ambushed by another soldier and experience the classic bloody screen. So Real! The soldier finds a Meaningless Stick which is of course a vital inventory item. Shortly afterwards, the General is here to further brief the player. Notice the General is willing to sacrifice his life by being hit by a jeep at 10MPH. He knows his death increases the drama of the story. The evil guy in the jeep knows about the slow motion bulletime and with his death from two or three bullets, the jeep just has to explode. Next is the obligatory paratrooper cutscene who is also self aware and breaks the 4th wall. His death unlocks the amazing "Sergeant of the Master Sergeants Most Important Person of Extreme Sergeants to the Max!". The only problem with the game is near the end of the game. The player picks up 500 sheets of wide ruled notebook paper and he really needed college ruled since wide ruled has far too much space for him. The Russian enemy commander ends up getting more development than the rest of the characters and is effectively overshadowing the gameplay. He wears an eyepatch and wears a nice suit, that's too much information! My soldier's effective negotiation strategy allows the war to be won without firing a single bullet at the guy. 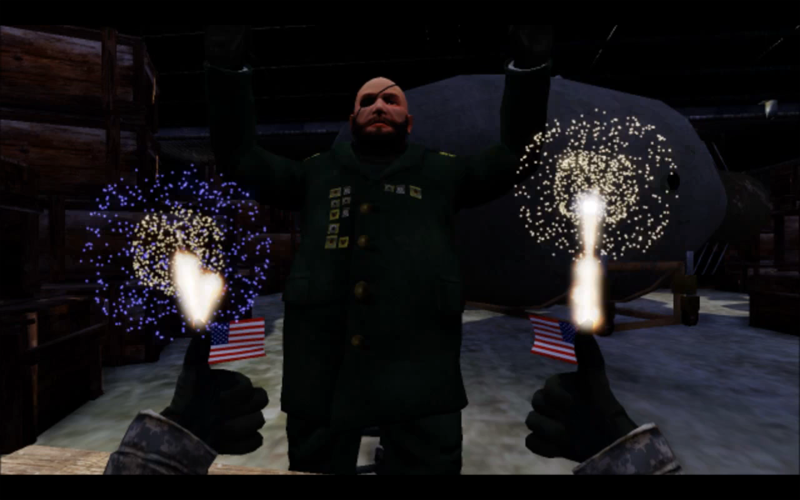 In response to the mission's success, my player unleashes his double thumbs up fireworks display with obligatory mini US flags. If only the Russian commander was also saluting the US flag with rockets coming out of eyepatch, I would have given this game a perfect score. Instead, we have the best Call of Duty satire out there in playable form. Sound and Graphics: In all honesty, Duty Calls single player was just the right length and was about as entertaining as the entire of the Black Ops single player game. Duty Calls really pushed the graphic envelope as my computer wasn't even able to contain the right side of the screen. The sound effects were realistic sounding and the cutscenes and useful items really cut deeply into the core of the Call of Duty franchise. The parody/satire level of this game is off the charts. Epic Games really knows how to pump out a full length 5 minute Duty Calls game and still have time to publish BulletStorm. I played the BulletStorm demo on PS3 but with my biased viewpoint, I still have to say Duty Calls is a much more solid game and definitely worth the free price of admission. I give Duty Calls two US firework thumbs up. Team Fortress 2: Meet the Spy!